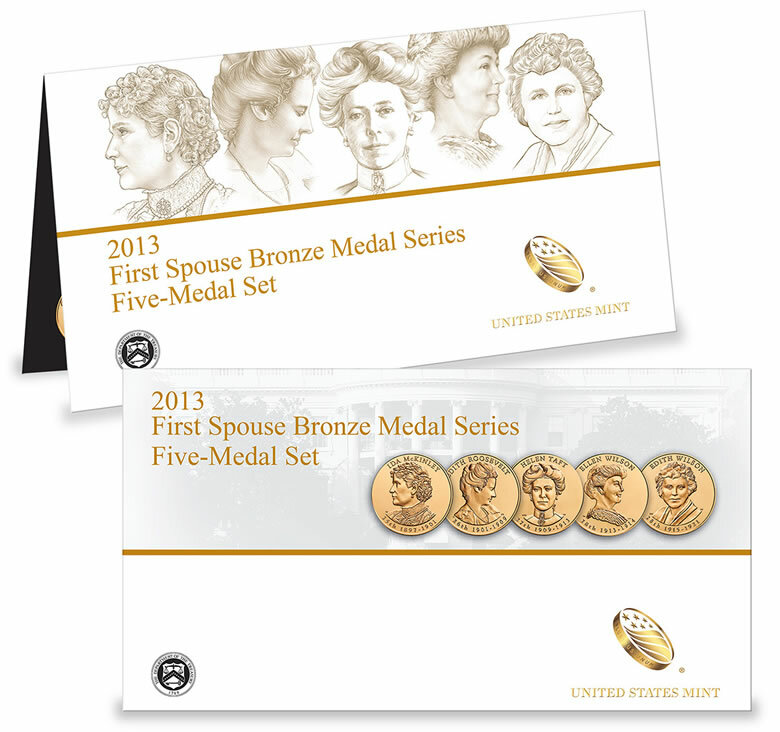 Today, Dec. 16, 2013, the United States Mint released its 2013 First Spouse Bronze Five-Medal Set. Its price is $16.95, the same as last year’s set but it had one less medal. In the set are all five 2013 First Spouse Bronze Medals with designs matching this year’s First Spouse Gold Coins honoring Ida McKinley, Edith Roosevelt, Helen Taft, Ellen Wilson and Edith Wilson. 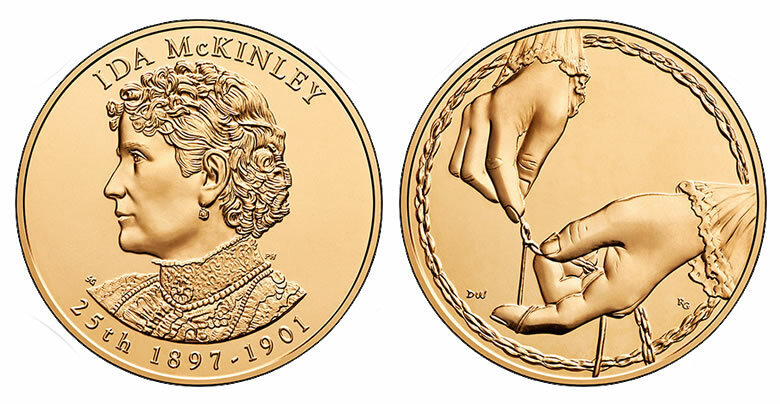 These 1-5/16-inch bronze medals are produced at the Philadelphia Mint. Obverses have a portrait of the honored lady and reverses portray a scene from her life. 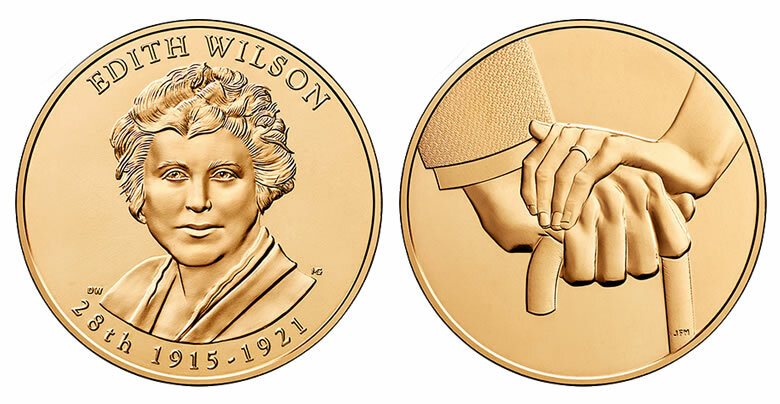 Summary design details and images of the bronze medals follow, along with links to CoinNews.net articles about the 2013 First Spouse Gold Coins. Ida, wife to William McKinley who was the 25th U.S. President (1897-1901), is remembered for her work in crocheting thousands of slippers for charity. The reverse of her bronze medal symbolizes that work. 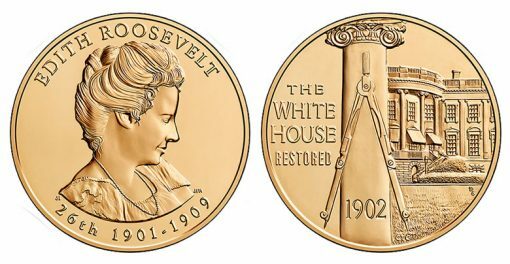 Edith, wife to Theodore Roosevelt who was the 26th U.S. President (1901-1909), is known for her work in restoring the White House. The reverse of her bronze medal symbolizes that by depicting the White House with a slightly off-center column and compass. 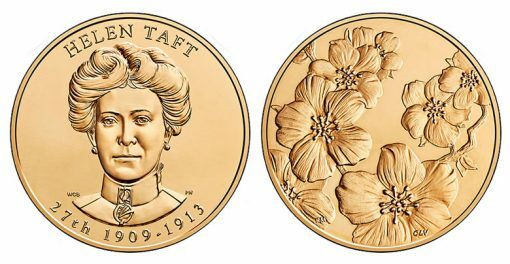 Helen, wife to William Howard Taft who was the 27th U.S. President (1909-1913), is remembered for her role in bringing cherry trees to Washington. The reverse of her bronze medal features a branch of Japanese cherry blossoms. 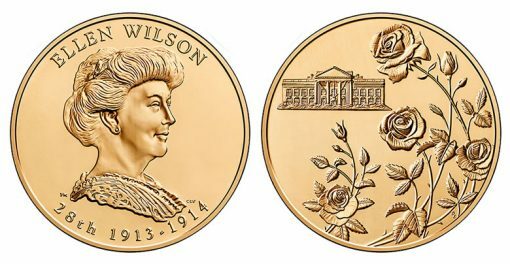 Ellen, the first wife to Woodrow Wilson who was the 28th U.S. President (1913-1921), is remembered for creating the White House Rose Garden. The reverse of her bronze medal features an image of roses with the White House in the background. Edit, the second wife to Woodrow Wilson, is remembered for her unwavering support of Woodrow after his stroke. The reverse of her bronze medal features shows her husband’s right hand holding a cane with her left hand warmly on his. 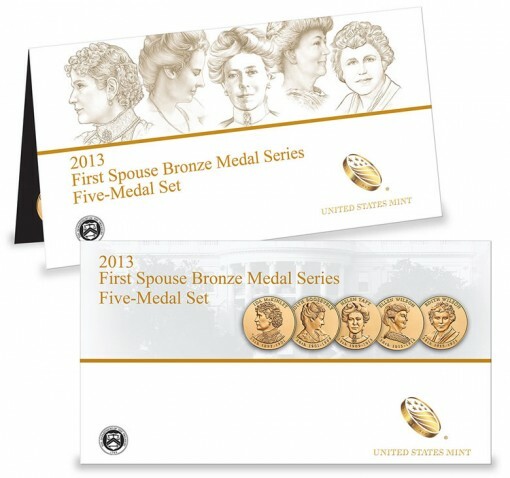 The 2013 for First Spouse Bronze Five-Medal Set may be purchased online by going to this U.S. Mint web page or by calling 1-800-USA-MINT (872-6468). A $4.95 fee will be added to all domestic orders for shipping and handling costs. The medals are mounted within a durable folded card, containing brief product descriptions, inside a special envelope. These same medals appear in their respective 2013 Presidential $1 Coin & First Spouse Medal Set for $9.95. The first one for William and Ida McKinley debuted on Nov. 19, the second one for Theodore and Edith Roosevelt went on sale Nov. 26, the third one for William and Helen Taft launched on Dec. 3, the fourth one for Woodrow and Ellen Wilson was issued on Dec. 10 and the final one for Woodrow Wilson and his second wife, Edith, launch on Thursday, Dec. 19. The First Spouse Gold Coin Program and related products started in 2007. First Spouse Bronze Medal Sets for the years of 2010, 2011, and 2012 are still sold by the Mint. For a 2013 U.S. Mint First Spouse Five-Medal Set, the highest recent price paid was for ebay item #281759547417 from seller gec-ftk that auctioned with 18 bids for $232.50 + $3.74 shipping on August 1, 2015 @ 1:25PM. On ebay, the 2013 U.S. Mint First Spouse Five-Medal Sets have recently sold from $159 to $232.50. This morning Tuesday September 22, 2015 @ 06:08 AM PDT, ebay item #171943180348 for a 2013 U.S. Mint First Spouse Five-Medal Set sold via Buy It Now for $240.00 with free shipping. This is now the highest most recently sold price. The 2013 U.S. Mint First Spouse Five-Medal Sets are the most valuable with ebay item # 131513105800 sold by seller mrbtus for $269.75 with free shipping June 30, 2015 @ 06:35:01 PDT.